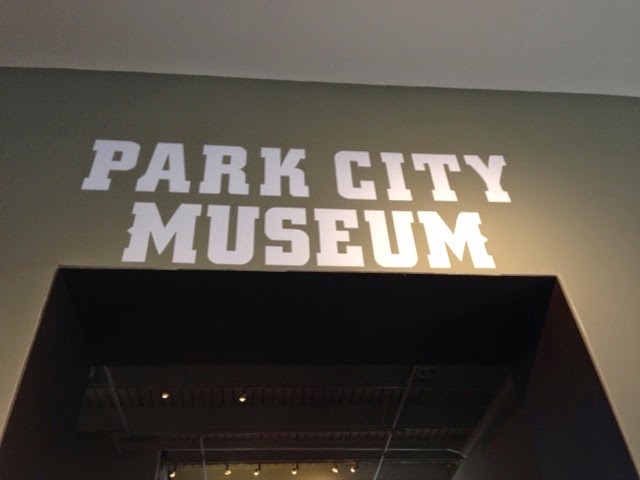 My Park City, UT visit started yesterday (Day 66) after my hike on Antelope Island. 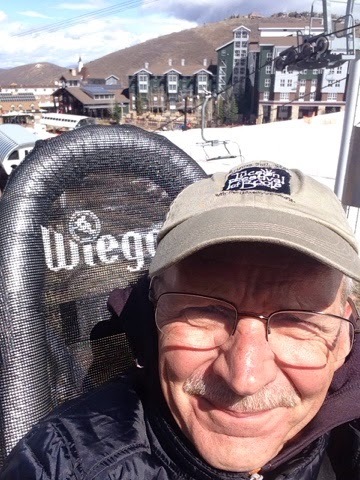 I drove the forty minutes east of Salt Lake City into the mountains to meet up with my son Clayton and his family their while they are on a ski-cation. 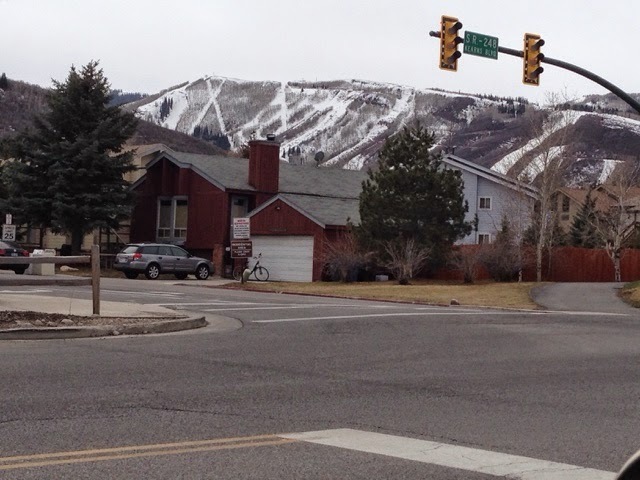 As you approach Park City you can see the ski runs on the mountain. You also pass the Olympic Village from the 2002 Winter Olympics. 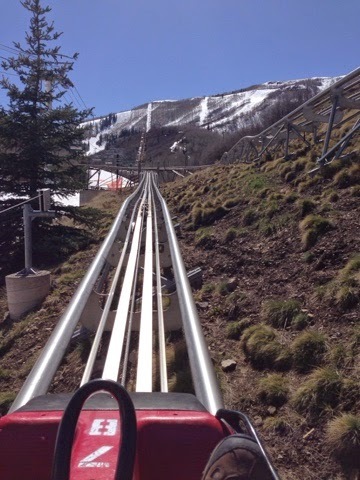 This view is from their slope side hotel. 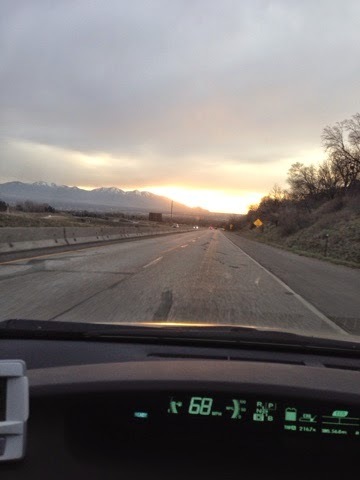 I'm staying in the metro Salt Lake City area as there is a significant cost saving per night, I get a hot breakfast, and I earn points towards free nights. 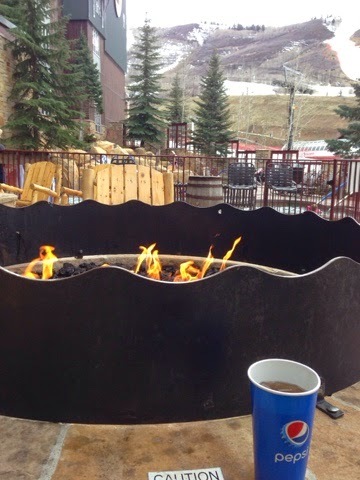 I was sitting by the fire waiting for my family to finish skiing for the day. 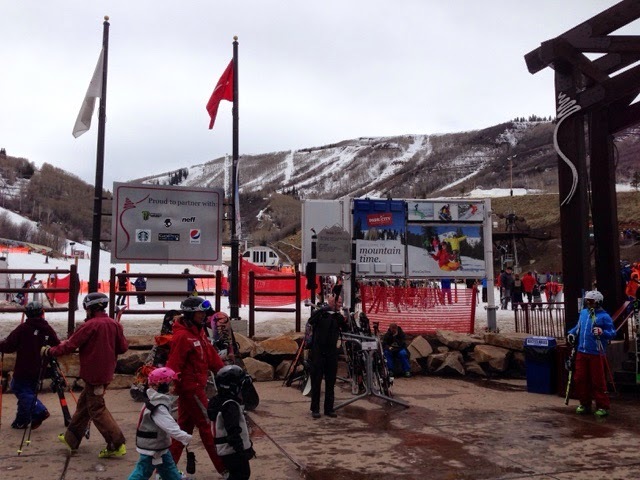 The girls are in ski school & the adults are doing their thing all over the mountain/s. 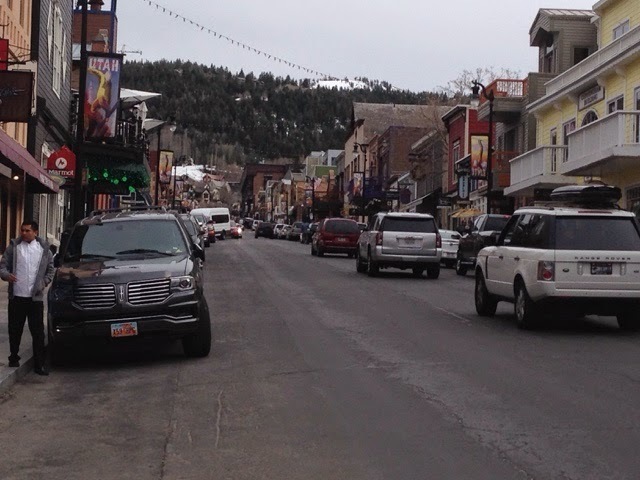 There is a large quaint downtown with a lot of shops and restaurants. Some shops are galleries with significantly high priced pieces of art. 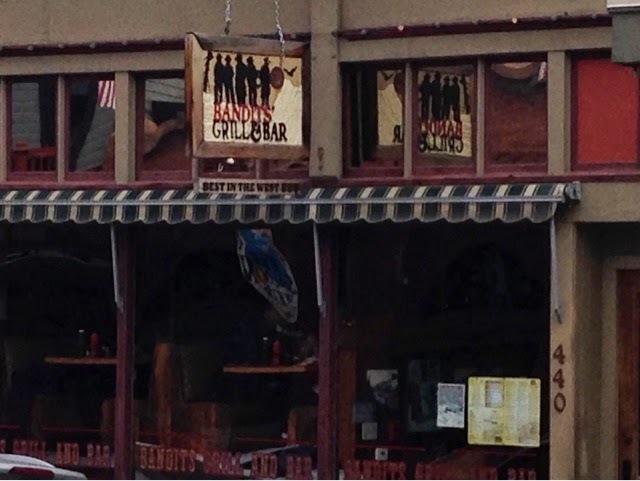 We ate dinner at the Bandits Grill and Bar. I had a very nicely presented shaved prime rib sandwich. It was very good. As I was headed back to my hotel for the night weather was coming in and we will have rain showers overnight Sunday through Monday. The higher elevations will get snow. This morning (Day 67) it was lightly raining in Salt Lake City and as I drove through the pass to Park City the rain turned to slush and eventually all snow but it didn't snow enough to stick to the ground. Not the nicest day to ski and Clayton had previously decided not to ski today due to the weather. 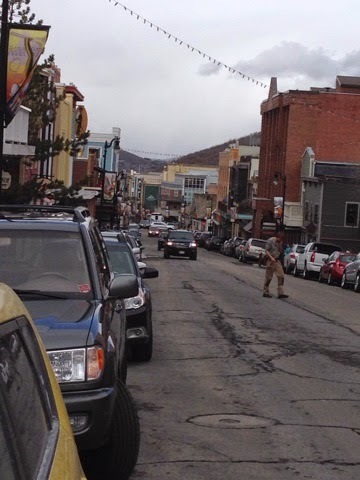 We met late morning and decided to tour down town by checking out some of the shops & the town's museum. 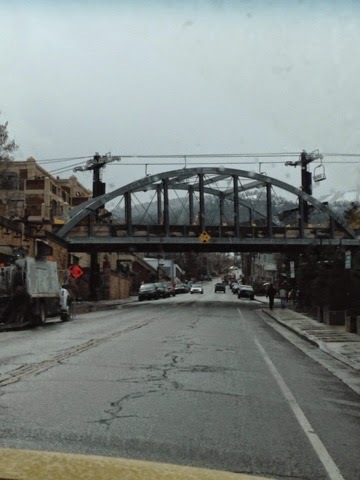 The bridge is covered with snow and skiers can ski over it and there is a chair lift to bring them back up the slopes. It cost me $10 to get in but the museum is well done with a lot to see. 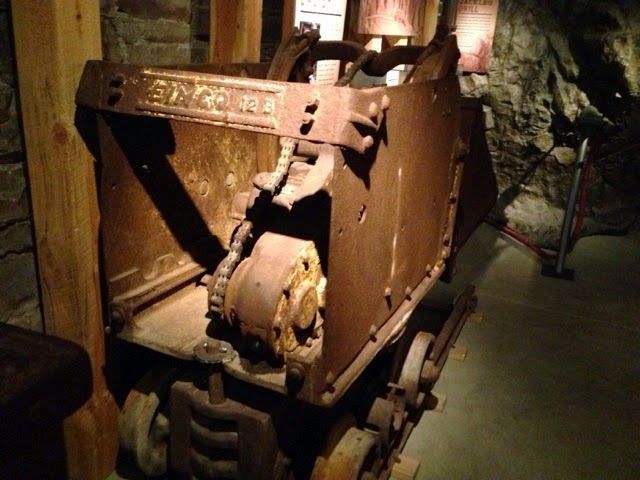 Mining was popular here with mines that had shafts that went down 900 feet. When the mines were closed down they used to reverse the process to bring people skiing to the top of the mountain. 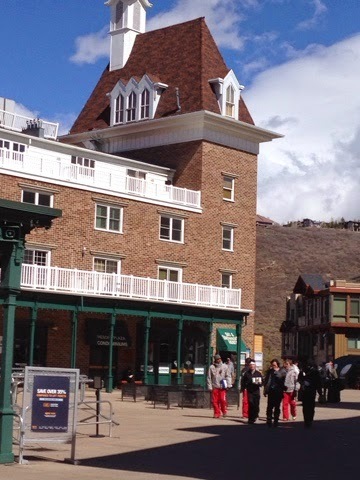 The rail cars above were to haul people into the lateral shafts and the mine elevators were used to bring the skiers to the top to ski down. 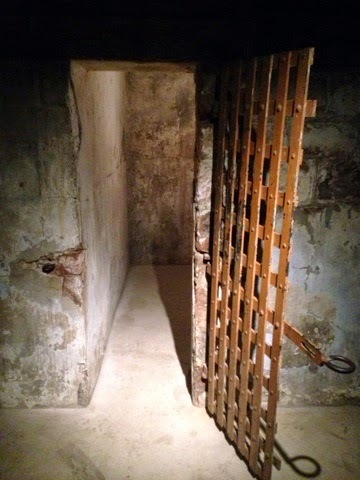 The jail is in the basement and they claim that 8 prisoners died in here. Originally it had dirt floors. 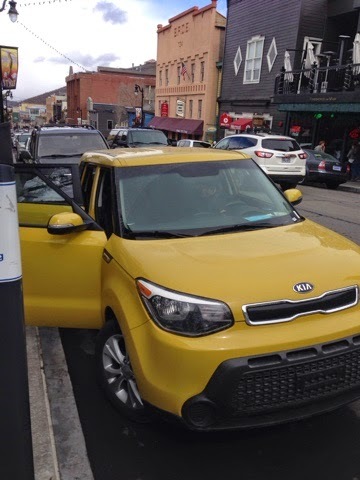 Clayton's rental is this banana yellow Kia Soul. It wasn't hard to find in the parking lot. Downtown there are also hotels that you can stay right next to the shops and restaurants. 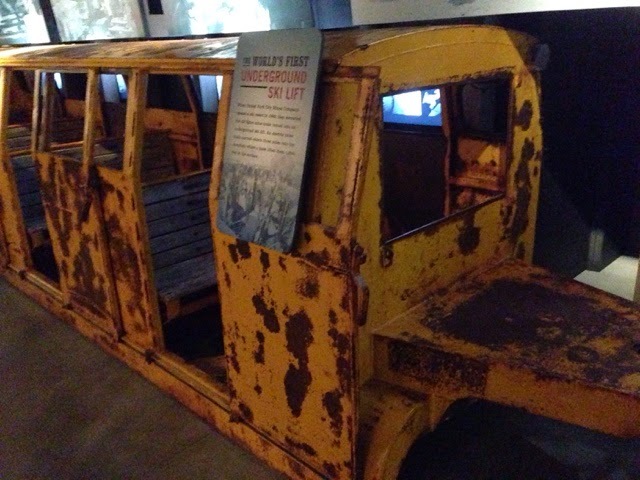 This car got "the boot" in front of the museum. Parking is by paying central meters and getting the receipt and putting it on the dash. 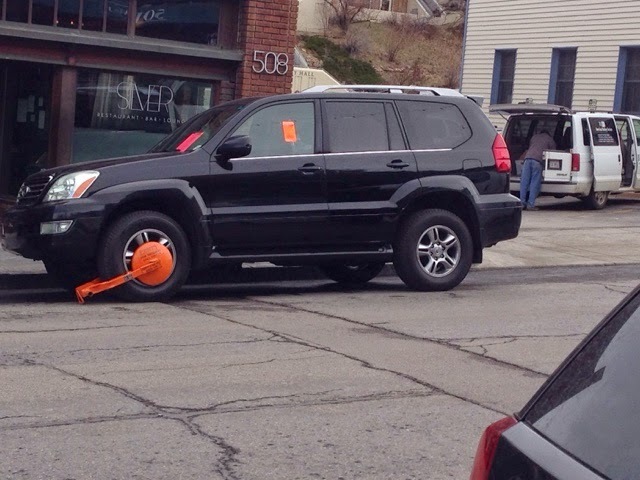 I guess the town enforces parking fees. 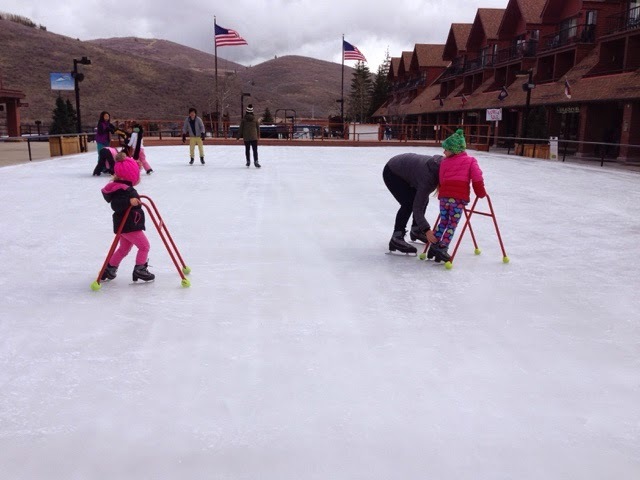 We went back to the ski area a half mile from the downtown area and the girls (granddaughters) wanted to go skating. The quickly dumped the ice walkers and went on their own. After a snack to eat the skys cleared for awhile to give us some cold sun. It was in the high 30's here today and around 60 in the Salt Lake City Area. 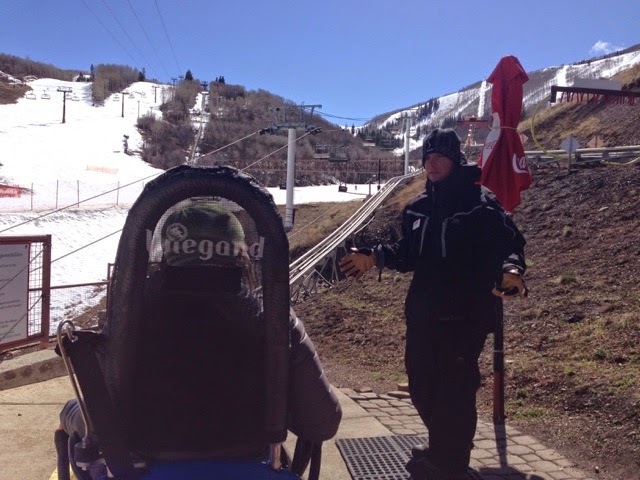 Clayton saw the weather change and thought he should have skied today. It was time for the adults to have some fun. 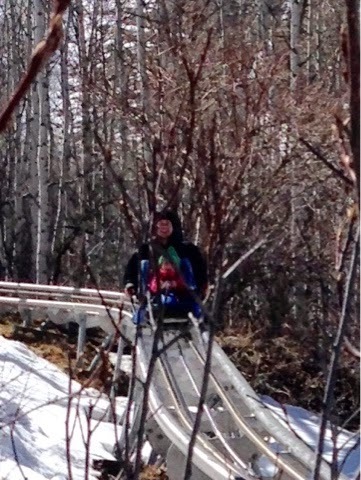 They took each of the girls on these alpine sleds that actually ride on tunes do they can't come off the rails. 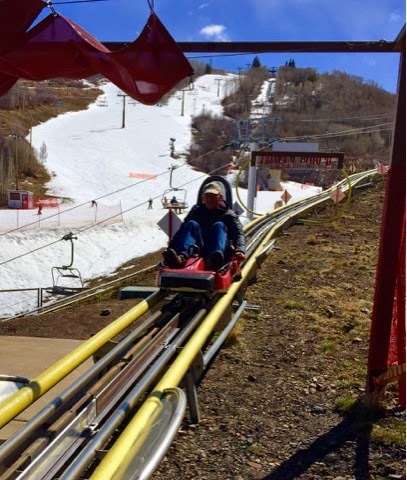 A cable system brings you way up on the side of the mountain and then all you need to do is push forward on the handles and you will go down the mountain as fast as gravity will take you there. Here I am on my way up. Here is Clayton and Taylor on the way down. Clayton took this picture of me as I am returning to the landing area. 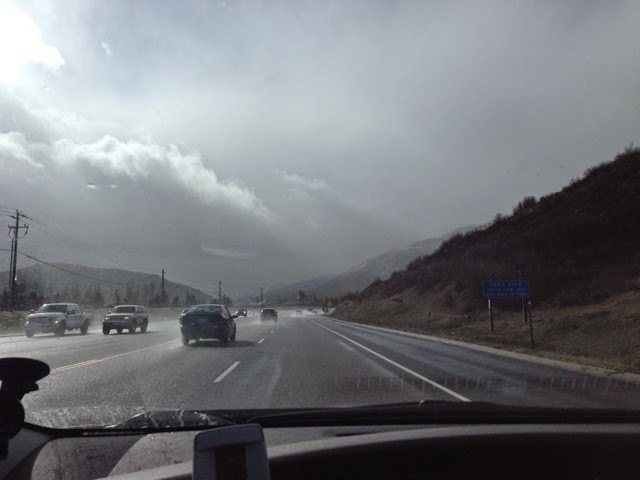 The weather quickly changed and some heavy snow showers were arriving. It was 4:00 pm and I decided to head back to SLC for the night as I didn't want to run into the possibility of not being able to get back as I don't have chains for the Prius and they are required by the signs on the highway. Tonight we had a thundrrstom in SLC.